Today marks the successful opening and 25th anniversary of ProPak Asia. Asia’s Number 1 Processing & Packaging Industry Event. Expanding 23% this year, ProPak Asia 2017 will present our Biggest-Ever Show taking place from Wed 14 to Sat 17 June, BITEC, Bangkok, Thailand. As Thailand advances towards 4.0, ProPak Asia delivers innovation for all manufacturers, big and small. Agri-business sectors are strongly emphasised by government as key industries where Thailand can lead. 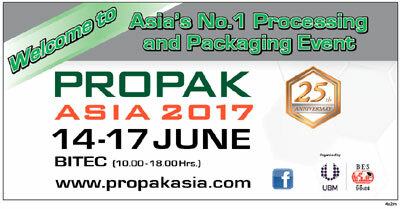 ProPak Asia is Asia’s biggest, most international and most important industry event. Now covering over 55,000 sqm of the exhibition space at BITEC’s new facilities. The 25th edition will feature over 1,800 exhibitors from 42 countries, 17 international pavilions from Australia, China (x2), Denmark, France, Germany, Italy, Japan, Korea (x2), Singapore, Spain, Taiwan (x2), UK, USA and a new Confectionery Pavilion including exhibitors from Germany and Italy,and over 45,000 trade visitors are expected during the 4 show days. Coding,Marking&LabellingAsia, Coldchain, Logisitics&WarehousingAsia and PrinTech Asia,driving innovation and enabling buyers and sellers to develop great business together. In addition to the huge exhibition, ProPak Asia will feature leading industry conferences and events including; Food Innovation Asia Conference 2017, Food Innovation Contest 2017, Asia Drink Conference 2017, Thai Beverage Industry Association with Ministry of Health Seminar, PharmaTech Seminar 2017, Thai Packaging Centre and TISTR Conference 2017, The Department of Industrial Promotion Seminar 2017, The FoSTAT-Nestle Bowl Quiz, Asia Food Beverage Thailand Conference, Food Focus Thailand Seminar 2017, Thai Star and Asia Star Packaging Awards 2016, SME focused workshops and packaging seminars, and many more. ProPak Asia 2017, The 25th International Processing and Packaging Technology Event for Asia will take place 14 to 17 June 2017, Halls 98 to 105 at BITEC, Bangkok, Thailand. Opening hours are 10am to 6pm everyday. ProPak Asia is organised by UBM plc. UBM is the largest pure-play B2B Events organiser in the world. About UBMUBM is the largest pure-play B2B Events organiser in the world. Our 3,750+ people, based in more than 20 countries, serve more than 50 different sectors. Our deep knowledge and passion for these sectors allow us to create valuable experiences which enable our customers to succeed. Please visit http://www.ubm.com/global-reach/ubm-asiafor the latest news and information about UBM.